A series of workshops designed for expats in the Netherlands! A complete introduction to the most important differences in beliefs and values between cultures. The Dutch culture serves as reference culture. Does any of the below ring a bell? Have you ever experienced rejection for something you thought was the ‘right’ thing to say or do? Do you feel that your reactions are different from what ‘they’ think as the ‘appropriate’ ones? And the worst: Is your different behavior interpreted as lack of competence or self-confidence? In all such situations you may indeed experience frustration or even rejection!. Yet, when tuning in such unexpected feedback, you consciously or unconsciously go through your very own personal negotiations. How would you behave next time? Dutch people when dealing with the ‘other’ in personal or professional life may also find themselves desperate and lost. Academic research among bicultural individuals children and adults has shown that men, for own psychological well-being, are able and do develop a bicultural mind: a mind that behaves naturally in culturally arisen conflicts and differences (see our ‘research’ section). 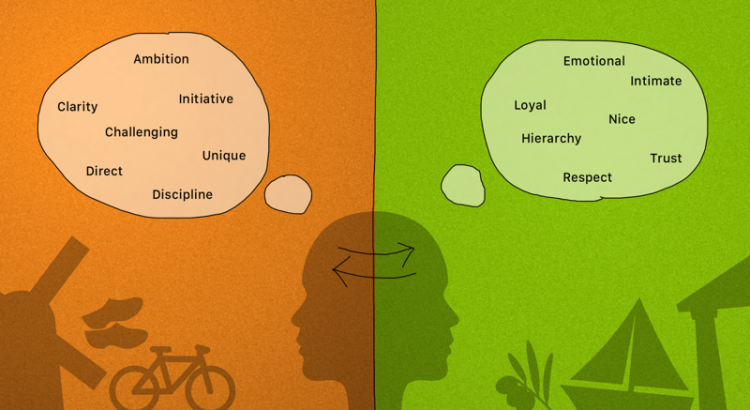 Values and relationships: do we make sense of our life in similar ways? E.g. important cultural differences in communicating our goals and wishes within families, with friends with colleagues. There are also important differences in communicating with or trusting family doctors, psychologists..
E.g. does the language I speak in affect the way I feel and think and if ‘Yes’, How? Your cultural state and eventual compatibility with or distance from the Dutch or other cultures will be captured by our tailor-made case studies and on-line questionnaire. Variations in the answers will be compared to established results from scientific research on cultural differences and discussed during each workshop. Each session runs for 120 min, including a break of 10-15 min. In addition 30 minutes personal consultancy via Skype will be provided to each participant after concluding the workshop. You become aware of how culture(s) inform values and behavior. You unlock your potential to respond naturally and appropriately to the ‘unspoken’ expectations of the ‘other’. We will also help you distinguish individual differences from those differences acquired through culture! Sessions are held on Wednesday evenings 19:00-21:00. Contribution: € 240 for the 4 sessions (excl. 21% btw). In interest of one specific session? Please feel free to discuss it with us! The workshop needs a minimum of 4 participants to proceed.